Editor’s Note: In the fall we invited blind Colorado high school students to apply for our first-ever scholarship to attend the National Federation of the Blind‘s annual Washington Seminar. Students were asked to submit an essay telling us why they wanted to go, and we selected two students to come with us. In fact, that’s where some of us are right now, including three staff members and three ITP students along with the high school students. Tomorrow we’ll be on the Hill going to appointments at all nine offices of the Colorado Congressional delegation. Here’s a press release issued today by the National federation of the Blind of Colorado. Littleton, Colorado (January 28, 2019) -Deyannira Villa Cazares, 16, of Denver, and Ian Lee, 18, of Aurora, join other Coloradans participating in the National Federation of the Blind’s Washington Seminar, January 28-31. Villa Cazares and Lee were chosen in a statewide essay contest. Two Colorado High School students will travel with more than a dozen blind Coloradans to Washington, DC to advocate for legislation to improve the lives of the blind throughout the country. The group will join more than 500 blind Americans at the 2019 Washington Seminar Jan. 28-31, held each year by the National Federation of the Blind (NFB). Deyannira Villa Cazares, a 16-year-old sophomore at DSST: Conservatory Green High School, and Ian Lee, an 18-year-old senior at Aurora West College Prep, were the winners of an essay contest sponsored by the Colorado Center for the Blind in cooperation with the National Federation of the Blind of Colorado for blind high school students to attend the annual event. Deyannira of Denver and Ian of Aurora will each receive an all-expenses paid trip to the seminar, where they will meet with Colorado’s congressional delegation and learn from leaders in the National Federation of the Blind. “One of the biggest reasons visiting Washington would enrich my life is that I want to be able to advocate for people like me, blind or visually impaired, to have the same rights or opportunities as sighted people,” Deyannira wrote in her essay. “I need to know what laws impact my life and what I can do to help influence changes in the future,” Ian wrote. The Access Technology Affordability Act (ATAA), which would provide a refundable tax credit for qualifying purchases of critically needed access technology. With this bill, Congress would stimulate individual procurement of this technology and promote affordability of these tools. The Greater Accessibility and Independence through Nonvisual Access Technology (GAIN) Act. The legislation would have Congress set minimum accessibility requirements for advanced digital interfaces which create barriers that prevent blind individuals from independently operating essential devices that enhance quality of life. The Disability Employment Act (DEA) is intended to spur innovation that will increase and enhance modern employment opportunities for people with disabilities. 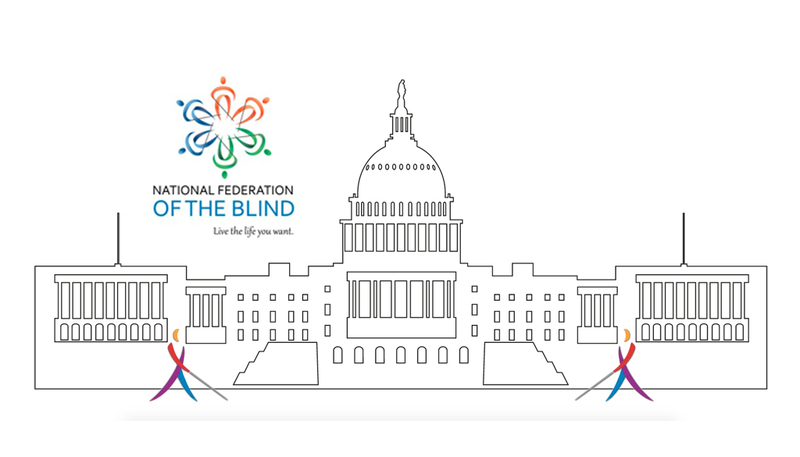 The Washington Seminar is an annual event of the National Federation of the Blind to introduce Congress to priority issues for blind Americans that require congressional attention over the coming year.